The other morning I paged through my Instagram feed and stumbled across a political meme I disagreed with. It was a from a guy I’ll call “Ferrari Frank 345” (FF345). Besides advocating a position clearly counter to my own, FF345’s post was mean-spirited, vulgar, and encouraged violence. A few posts later I came across another nasty meme. It used the same lurid colors and vile sentiments. I knew it was FF345’s handiwork. Just three or four posts later I found another and then another and then another of FF’s memes. After a while, it seemed like the only posts on my feed were these nasty memes from this angry guy. My first inclination was to simply block FF345. But because I always find it curious to see what people have to say, whether or not I agree with them, I clicked on FF345’s link and went to his profile page. That’s where I found FF345’s full name and city of residence. I already know what’s he’s posted on Instagram. I wonder what FF345 posts on Twitter, Facebook, and LinkedIn? It only took a few keystrokes to find out. On Twitter, he described himself as a “Roman Catholic,” yet filled his posts with profanity, hate speech, and more calls to violence. His Facebook posts were no different – a scrolling tirade of racist comments, violent threats, and profane memes (peppered with some cheers for his favorite sports teams and silly animal videos, by the way). FF345’s LinkedIn profile, though, was a bit different. Here’s what I found (Note – I’ve changed his name and altered a word or two in his profile post so this blog doesn’t link to him. I have no interest in calling out FF345 for his transgressions nor publicizing him to his like-minded cohorts). The guy I’d been cyberstalking was looking for a job. 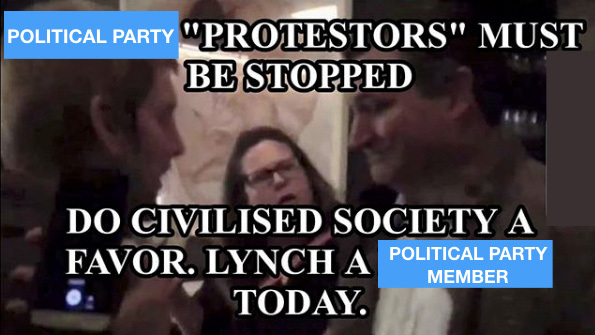 The guy who wrote: “ [POLITICAL PARTY] “PROTESTERS” MUST BE STOPPED. DO CIVILISED (sic) SOCIETY A FAVOR. LYNCH A [POLITICAL PARTY MEMBER] TODAY” wants us to believe that he has an “excellent ability to maintain relations”? Really? An EXCELLENT ability to maintain relations? What’s the chance that anyone who may have been interested in hiring FF345 would offer him a job after they’d read his social media posts? Even if they agreed with his abhorrent beliefs, why would they want to hire a salesperson who would repulse their customers with violent threats? And this from a guy who lists “market research and marketing” on his list of specialties. Needless to say, anyone who specializes in market research and marketing would know how easy it is to find all of his different posts across his various social media platforms. Now if you’re as smart as I know you are, you’ve already figured out that this blog post isn’t really about the guy I’ve been profiling. Since I wrote a book titled All About Them, chances are you’ve already figured out that this blog is about you and your online universe. Have YOU thought through YOUR social media strategy? Have YOU made a conscious decision to understand what you want from Facebook, Instagram, Twitter, and LinkedIn? Have YOU created posts to help you achieve that? Or do YOU see these online communities as private clubhouses where you can misbehave and spout off whatever’s on your mind at the moment with no regard to the consequences? My guess is that Ferrari Frank 345 hasn’t thought this through. Call me a skeptic but I’m pretty sure FF345’s social media posts aren’t going to help him find the job he’s looking for either.